Your financial gift helps to build homes and hope in Warren County, Virginia. Warren County Habitat for Humanity is a fiscally responsible nonprofit organization that pairs your donations to support our ministry of proving affordable housing opportunities for residents of our area. Give a gift that builds more than a house, give a gift that builds brighter futures for our local families and their children. 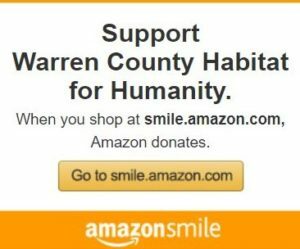 Amazon will donate 0.5% of the price of your eligible AmazonSmile purchases to Warren County Habitat for Humanity whenever you shop on AmazonSmile. Start shopping HERE! Vehicle donations are another way to support the mission of Habitat for Humanity of Warren County. When you donate a vehicle to Cars for Homes, you will help your local Habitat for Humanity build and rehabilitate houses with families in need of affordable shelter. The car donation process is quick and easy! It can be done online or with a toll free phone call to 1-877-277-4344. If you donate an automobile or other vehicle, you may be eligible for a tax deduction. Read more about the benefits of donating your vehicle, the process, and tax documentation here.